When you read my blog, you’ll see a recurring theme about my frantic, frazzled, always-on-the-run lifestyle. Fast food drive-thrus must have been invented for just my family’s hurried pace. Two kids, two different schools, both more than a half-hour away from our home plus time-consuming extra-curricular activities. Not to mention that we live in the busiest traffic area in Northern California. Fortunately my family’s taste buds have never allowed me to follow the fast food path. My daughter refused to eat McDonald’s ever again after watching the movie Super Size Me and my son never enjoyed any meal from a fast food chain. As a result, many of the stories I tell on my blog tie into recipes and prep techniques I adapt to fit our hurried pace, such as the time I taught my son to roast a chicken using a smartphone. So if your lifestyle is anything like mine or you just find yourself succumbing to the ease of fast, processed food, my suggestion is to create your own fast food at home. Healthy unprocessed foods can be prepared quickly (and affordably). Eggs are a great example. You can hard boil them and have them ready to grab at anytime. Or in less than five minutes, you can scramble, poach, or pan fry them to create so many different protein-rich meals to start or end your day. Frittatas can be prepared when you have a little time at home, but are easily stored in the fridge for later use as a breakfast on the run, a sandwich, or paired with a salad for dinner. Inspired by an award-winning cookbook published in 2011, Ancient Grains for Modern Meals by Maria Speck, I have been exploring different types of grains, especially those packing nutty flavor and protein. Two recent favorites are farro and wheat berries. But many other choices would work as well including brown rice, bulgur, quinoa, or couscous. The technique is so simple – Heat a frying pan to medium, add a quick splash of olive oil and about a ½ cup of any leftover grain you have in the fridge: farro, wheat berries, bulgur, or rice and sauté to heat through and crisp it for a few minutes, adding a bit of salt and pepper to taste. Then move it to the edges of the pan, creating a circle in the center and crack in an egg or two, also adding a bit of salt and pepper if you like. Fry to your taste and enjoy with the crispy grains. When you crack the yolk, it creates a sauce that is a lovely complement to the grain’s nutty, crispy texture. Want to step it up a notch? You could certainly sauté some onions or shallots or mushrooms before you add in the grains. 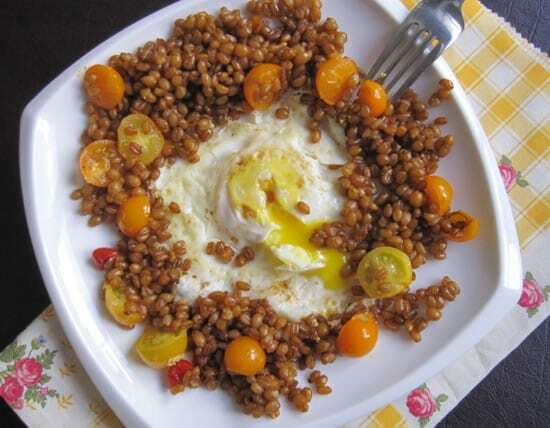 Or add some halved cherry tomatoes – the freshness of the tomatoes with the yolk and crispy grains is heavenly. Or as Maureen Abood suggested in her blog Rose Water and Orange Blossoms, sprinkle za-atar seasoning over the eggs – so simple but such a wonderful surge of flavor and one that would be perfect with the tomatoes. There are many methods for cooking the different grains (all simple) – some are quick cooking, some are slow-cooking but all will stay fresh in the refrigerator for several days. Cook some up on a Sunday and make use of them all week. Most grains are as easy to cook as a pot of pasta – here are some tips and trick from Maria on selecting and cooking a variety of whole grains. Think of this recipe as a great way to use up leftovers, enhanced by the protein punch and flavor of fresh eggs. Serves 1, but easily doubled, tripled, or quadrupled. Only limited by size of your pan and amount of leftovers. Heat a small or medium size sauté pan to medium heat. Add the olive oil as the pan warms, then pour in the grains and stir them around until they glisten with the olive oil. Add some salt and pepper to taste. Let the grains crisp up for 2 – 3 minutes, stirring every minute or so. If you are using tomatoes, add them in with the grains. When the grains are crispy, push them to the outer edges of the pan, leaving a hole in the center for the egg (s). If you are not using a non-stick pan, you might want to add another drop of oil or butter to the egg spot. Crack the egg (s) and prepare either sunny side up or over, as you like them. If you are using additional seasoning, add it after you crack the eggs into the pan. When the eggs are done, remove the contents to a plate, break open the yolk and enjoy. 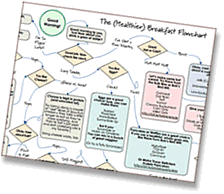 The whole process will take you far less time than stopping at a fast food restaurant and ordering a highly caloric, low-in-nutrition, high-in-fat breakfast sandwich, I promise. I am always looking for new ideas for quick meals (which for me always includes eggs)…this is perfect! Thanks for the ideas. Glad you are inspired by it! And it’s so easy to put your own spin on it as well. Hi Andrew! Love your EATING RULES!! Especially this post on healthy grains, tasting so good sauteed with a fried egg. Thanks for the mention about my za’atar fried eggs…I’m going to try them with a whole grain like bulghur or any of the ones you mentioned, and SOON! Hi Maureen! I found your site through Cheryl Sternman Rule and just loved the idea of the za’atar on the fried eggs! Simple but so yummy. On my FB page, someone told me they added black beans and cilantro – doesn’t that sound good too? What great ideas, Beth! Thanks for sharing!! Thanks for coming by Cheryl. Come back and let us know when you try it. So many great ideas come from each person’s kitchen! That would be nice for lunch as well! And I’m a big fan of breakfast for dinner – this could certainly hit the spot for lunch or dinner. I was looking for you at the Denver airport today but you weren’t there – did our travel schedules get off sync? 🙂 Great seeing you last week and thanks for coming by to read and comment!